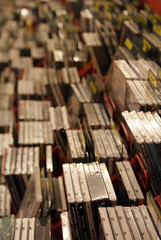 It's a common problem for owners of large MP3 collections: out of control genres. Too many genres or too few, some too specific, some too broad, some plain wrong. Genres soon become next to useless when browsing your music collection. What's the best way of cleaning up genres? One way of controlling your genres is to decide on a list of genres that you will allow in your collection, and then make sure all of your music complies with this list. By imposing this structure you are more likely to come up with something holistically consistent. But what list of genres should you choose? Well, there are a number of lists available on the Web that can make a good start point. FreeDB has a broad collection of top level genres. Discogs similarly has a broad range but allows the genres to be combined and also defines styles as sub genres for a deeper tree. Wikipedia mainly concentrates on pop music genres. AllMusic probably has the most exhaustive list of all. Back in January 2011 I collected these top level genres to come up with a definitive fundamental music genre list. This is a list of top level music genres that the different music databases appear to agree on. So these general music genre lists can make a good starting point. In particular they can be the solution to a common problem: overly specific music genres. But they probably aren't the ideal solution for you. The reason? It's all about balance. Balance? Here's what I mean: visualise genres as a tree; rooted with the fundamental music genres described above, with branches for sub genres and styles. Most people's music collection is dominated by the musical genres they are interested in. Being extremely stereotypical, a younger music collector may own a lot of hip-hop, and an older collector own a lot of classical or jazz music. If the fundamental music lists above are applied blindly the music collector will end up with some genres with an enormous amount of music categorized therein, and others with very little. The genre tree is out of balance. An out-of-balance genre tree. Some genres have significantly more albums allocated to them than others, which makes browsing these genres more difficult. How to achieve balance and, thus, how to decide on your ideal allowed genre list? Well, where you have overweight genres, these genres should be split. Take the older music collector stereotype above. The collector owns a lot of classical music, so we split the classical music genre into sub genres. For instance, baroque, opera, romantic, minimalism and so on. By splitting the genre we are reducing the number of recordings in each genre. The question comes up, how many recordings or albums should I have in each genre? This tends to come down to how easy it is to browse on your particular music player. Maybe browsing small or large lists is easy, so it doesn't matter, and you have a maximum size of, say, one hundred albums before you split a genre. Or maybe scrolling the list is a pain and you want to maintain a larger, more specific list of genres, so you set it to twenty. However, these hard figures should probably be considered in the light of the overall collection size. A collection of fifty albums will inevitably have smaller genres than one of five thousand. You could also consider merging top level genres which have few recordings within. Whether this is possible may depend on whether the merged genre makes sense. You might come up with a more general name, for instance 'contemporary' to fuse electronic, rock and reggae, or maybe simply 'Other'. An more balanced genre tree. Genres are now easier to navigate and your classification better reflects your own tastes. Once you have split your genres to achieve balance, it's time to change all of your albums so they fall within one of the allowed genres. This is the most tedious part of the process. Fortunately software tools such as bliss and MP3Tag exist to help with the process. By considering the balance of your MP3 genres you can make your music collection more navigable. I wish you luck in your efforts! Thanks to Marc Wathieu for the image above.